These benefits are linked to the volatile oils found in chamomile flowers, which include bisabolol, bisabolol oxides A and B and matricin, as well as other bioactive ingredients: Chamazulene, Farnese, Glycosidese, Hydroxycoumarins, Flavonoids, Coumarins, Terpenoids and Mucilage. 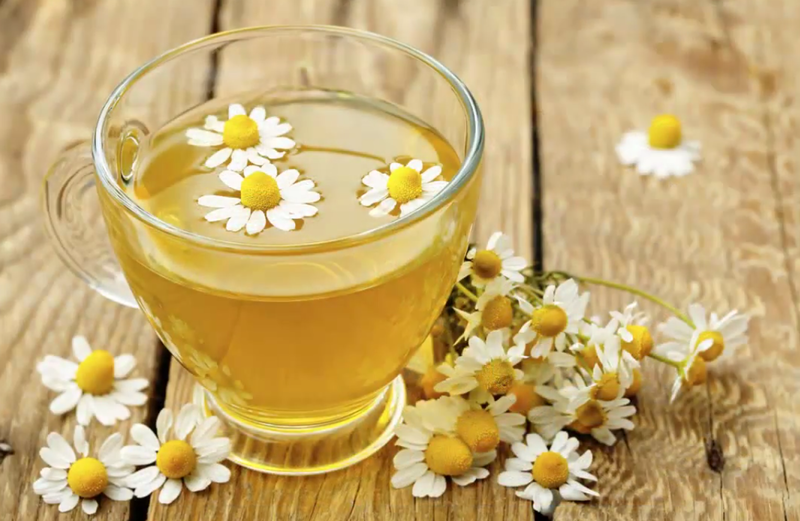 Chamomile tea is well known for its relaxing and immune boosting benefits. It has a way of warming and soothing the soul during tough times. There are two types of chamomile: German and Roman. They both have benefits, but German kind is considered more potent and has been researched extensively. This tea has a wide range of benefits, and is an essential addition to your pantry. Calming down nerves, promoting general relaxation, relieving stress and controlling insomnia. Combating allergies, eye inflammation, and infections. Alleviating muscle spasms and menstrual cramps. Relieving nausea, heartburn, and stress-related flatulence. Helping to ease stomach ailments, gastritis, ulcerative colitis, diverticular disease, Crohn’s disease and irritable bowel problems. Inflammatory bowel disease or ulcerative colitis. Chickenpox, diaper rash, colic and teething problems in children. Nowadays, chamomile can be used to relax muscle contractions, typically the smooth muscles of the intestines. It’s added to salves, lotion or a wash or compresses to relieve hemorrhoids, wounds, burns, irritation, cold or canker sores, pink eye, dermatitis and inflammations of mucous tissue. Some salads, soups or drinks use fresh or dried chamomile flowers. The essential oil and flower extracts are also added to foods, while chamomile leaves can be used in salads or steeped into tea. Sometimes, chamomile is incorporated into skin and hair care products, ointments, shampoo, soap, detergent, perfume, and cosmetics. Bioremediations for metals like cadmium. 1. Gupta, Sanjay, MD. “Chamomile: A Herbal Medicine of the past with Bright Future.” PMC. U.S. National Library of Medicine, 01 Nov. 2010. Web. 7 Aug. 2013. 2. “A Metabonomic Strategy for the Detection of the Metabolic Effects of Chamomile.” National Center for Biotechnology Information. U.S. National Library of Medicine, n.d. Web. 07 Aug. 2013. 3. Gupta, Sanjay, MD. “Antiproliferative and Apoptotic Effects of Chamomile Extract in Various Human Cancer Cells.” National Center for Biotechnology Information. U.S. National Library of Medicine, n.d. Web. 07 Aug. 2013. 4. “Proof of Efficacy of Kamillosan(R) Cream in Atopic Eczema.” National Center for Biotechnology Information. U.S. National Library of Medicine, n.d. Web. 07 Aug. 2013. 5. “Apigenin and Cancer Chemoprevention: Progress, Potential and Promise (review).” National Center for Biotechnology Information. U.S. National Library of Medicine, n.d. Web. 7 Aug. 2013. 6. Zick, Suzanna M., Benjamin D. Wright, Ananda Sen, and J. Todd Arnedt. “Preliminary Examination of the Efficacy and Safety of a Standardized Chamomile Extract for Chronic Primary Insomnia.” National Center for Biotechnology Information. U.S. National Library of Medicine, 22 Sept. 2011. Web. 07 Aug. 2013.